Rediff.com » Movies » After Kamasutra 3D, he wants to make a film on NAMO 4D! After Kamasutra 3D, he wants to make a film on NAMO 4D! 'It's like the doubts the Jews had about Jesus Christ. Only after He was crucified, did they realise that He was the Messiah,' says director Rupesh Paul who plans to direct a film inspired from Modi's life. Even before his bold film Kamasutra 3D, starring Sherlyn Chopra, hits the theatres, filmmaker Rupesh Paul has moved on to his next project. Paul, an engineer-turned-journalist-turned-director, plans to direct a film inspired by the life of Narendra Modi, the Bharatiya Janata Party's prime ministerial candidate. Titled NAMO, the title role could be played by Victor Banerjee, who has acted in both Satyajit Ray and David Lean's films. It will be shot in 4D format. In an exclusive interview to Rediff.com's Shobha Warrier, Paul discusses his Modi film. Was it because Narendra Modi was declared the BJP's prime ministerial candidate that you decided to make a film on him? NAMO is inspired from the life of Narendra Modi. It's not a biopic as such, it is the story of a leader that India has been waiting for a very long time. We have taken creative freedom to write the screenplay. The idea to make a film based on Modi's life was (associate producer) Mitesh Patel's. He has taken permission from Modi. Mitesh Patel is associated with Kamasutra and its US sales. While we were making Kamasutra, we used to discuss the idea, and I would give a lot of inputs. I even suggested the names of many directors. Not even in my dreams did I think about directing a film on Modi. But he (Patel) could not get anyone to sign even after a year. Some were biased while others were scared. Some of the actors he approached were also scared. Two days ago, he called me and said, 'I got the director to make NAMO.' When I asked who it was, he said it was me. It is not because I am a brave filmmaker. I agreed because I believe that India is waiting for a leader like Narendra Modi. I don't know whether the leader is Modi himself, but I know India needs a leader like him. It's like the doubts the Jews had about Jesus Christ. Only after He was crucified, did they realise that He was the Messiah. What did you think about Modi before you agreed to direct the film? I disagree strongly with the kind of ideology he is a part of. But as an individual, I believe the country will not get a better leader than him. How will you make a film on a personality whose ideology you don't agree with? At present, what we need is not any 'ism' or philosophy. India needs a great leader, and that is this man. Your teaser stresses on India's economy by showing that Rs 1 was equal to $1 in 1947. Are you going to focus on Modi's economic policies? It is not about his economic policies. The teaser talks about the condition of a country that is going to burst. The pace at which the rupee has dropped against the dollar in the 1990s was alarming. To stress the urgency, we have used that kind of music. I compared the rupee with the dollar to stress the depths to which the country has reached. Is the movie about the emergence of a leader in troubled times? It is a political thriller. When a very strong leader emerges, there will be a lot of negative forces to subjugate him. There will be a lot of factors to attack him, humiliate him and end him. How he overcomes all these factors and emerges as the leader is the story of the film. Modi's life story has a lot of drama. Will the film have a lot of drama too? The story of the young Modi resembles the life of Narendra Modi a lot. But we have taken creative freedom to depict his young days, like you saw in Bhaag Milkha Bhaag. We have to accept the fact that Narendra Modi is no Mahatma Gandhi. Based on the inputs I gave, we made a long synopsis. Mitesh Patel met Modi several times and had discussions with him. I have not seen or met Narendra Modi yet. You are making the film in 4D. 4D is the next technology. The Koreans and Chinese are making 4D equipment cheaper. When we are talking about a leader whose ideas are advanced and futuristic and who dreams of making India a superpower, we should use technology that will rule the future. We will have a lot of action sequences in the film and 4D will enhance it. It will be more like JFK and The Day of the Jackal. Narendra Modi is a controversial political figure. How will people view a film on him? He is the only hope the country has. If we have no hope in him, we will have no hope for the country too. What we need today is a male Indira Gandhi. She was not a perfect leader, but the country needed a leader like her then. The country is indebted to her, but at the same time, she has done so many bad deeds too. My personal conviction is that like India needed Indira Gandhi then, India needs Narendra Modi now. When will you start shooting the film? As the producers wanted to make use of election time, we plan to finish shooting in 35 days, starting on February 15. We hope to release the film in April or May. 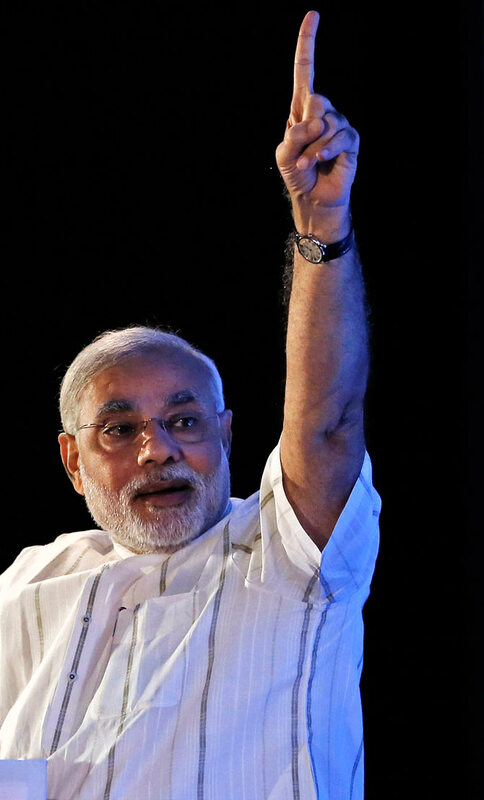 Who will portray the role of Narendra Modi? My personal preference is Victor Banerjee, but the producers are talking to some Hindi actors. Other than a fantastic actor, Victor Banerjee is a Modi fan and close to him too. How confident are you about directing the film on Modi? I worked as a political journalist for eight years. I have never done an entertainment story in my career, but I am a little scared about the kind of expectations people have from a film on Modi. It's like what people expect from him. We can't let them down. We cannot afford to fail. I want to say one thing. The propaganda is that minorities are scared of Modi. I am also from the minority community. I am a Catholic and Catholics form only 0.02 percent in India. But I am not scared of Narendra Modi. Image: The movie trailer of NAMO. Can Arvind Kejriwal check-mate Narendra Modi?